Let's face it. Overall, our spatial awareness is horrible. There is an increasing number of accidents involving people who are distracted - often by mobile devices such as iphones, cell phones, and ipads. When I walk busy areas in Toronto - Dundas Square, Yonge St., Bloor St. - I find myself evading approaching pedestrians, their heads down, oblivious to me and all others. Great self defense training but irritating and potentially dangerous. Predators also create or wait for an opportunity when the prey is distracted and has limited escape routes. A example is a wildebeest grazing or drinking at a waterhole. When the predator gets into striking distance they do so with great force and speed. Human assailants, at least the cunning ones, approach victims in similar ways, from surprise directions, walking quietly, and striking quickly. A distracted person person simply makes their job easier. I certainly don't recommend you walk with your head on a swivel. Nor do I expect this article to lead to a widespread reduction in the irresponsible use of communication devices. What I do ask, however, is that you strive to reduce the advantages and opportunities that your distractions offer potential assailants. Awareness and prevention. Two cornerstones of practical self defense. P.S. 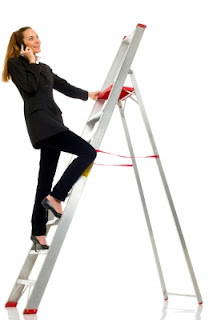 Don't read this blog while walking, biking, driving, or climbing a ladder!